Another great way to access the market and manage your trades. A prepaid card to use and withdraw funds from anywhere. Benefit from our 'Client Fund Insurance' that grants individual coverage. We deliver individual, corporate and institutional services globally through our decentralised international offices. We are a team of passionate traders, tech evangelists and educators, proud of a heritage that hinges on innovation, transparency and service-excellence. We believe that trading should be an easy, safe and productive experience. Our offerings are an extension of this philosophy. and expert support. Here are our top four competitive advantages. 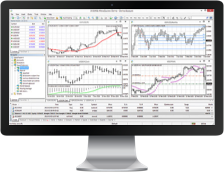 Location and device agnostic, our MT4 platform offers multi-asset trading flexibility plus an advanced charting package as well as 30+ technical indicators. Prices may be delayed by 5 seconds. Prices above are subject to our website terms and conditions. Prices are indicative only.